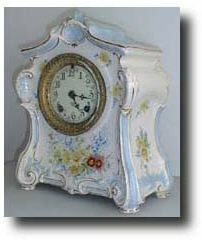 Ansonia "La Fontaine" Royal Bonn China Clock , circa 1900 Clock in excellent condition. Porcelain dial. No chips, no repairs, small hairline in rear corner. Case: Marked Royal Bonn China. Made in Bonn, Germany for Ansonia. 11 inches tall. Works: Ansonia 8 day brass movement with strike on gong. Reference: Ansonia Clocks by Tran Duy Ly Condition: Case - Excellent- no repairs, front with no cracks or chips, only a surface hairline on back, ; Works - Excellent.